Description: Large deciduous tree. Susceptible to Dutch Elm disease and accordingly not planted any more. Height 40m. deciduousAge up to 500 years It often branches near the base forming a dome-shaped crown. The clusters of tiny, bell-shaped, green flowers open in late February and March, well before the leaves. 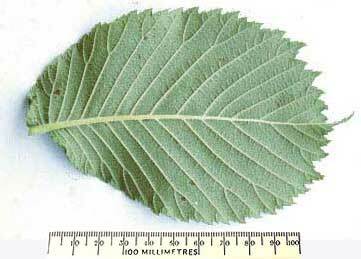 The leaves are alternate, 7-16 cm long, with a strongly toothed margin, with one side longer than the other and overlapping. The short leaf-stalk is less than 10 mm long. The upper surface is rough to the touch, the lower more softly hairy. They are often 3-pointed at the tip.The young twigs are covered in coarse, rusty coloured hairs. The bark is grey with many long fissures. It is native in damp woods, hedges and along streams. The fruit is flattened, broadly winged, penny-sized and light green, with a single seed in the centre. Typical hedgerow tree but found up to 300m. Requires non calcerous top soil. In mixed woods with Whitebeam and small leave lime and in Oak and Ash woods. Common in North and West of Britain and Ireland. Native throughout Europe and W. Asia. Strong and supple pale brown wood. Prone to shake. Cannot be split leading to particular uses. Does not decay when immersed in water. Uses of wood - Used to be used to make chests, water pipes and troughs and for sea defenses. Also for sections for cow sheds, cribs and mangers, hubs of wheels, coffins and furniture. 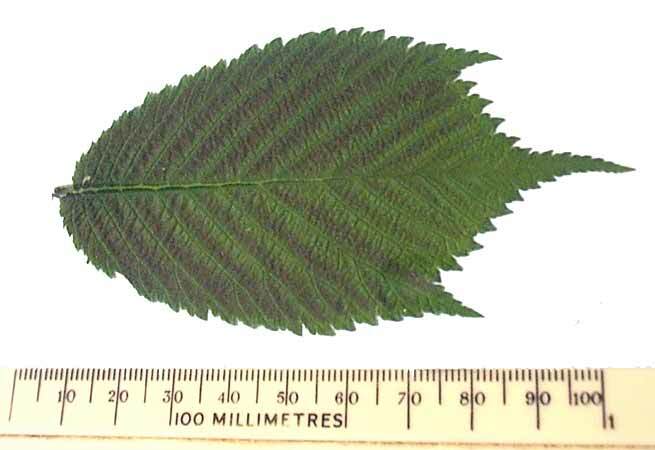 Food and drink - Leaves once used for livestock.It is less prone to attack by Dutch elm disease than other elms, so that large trees may still be seen, particularly in Northern Britain.The wood is very durable in wet conditions. It was once used to make underground water pipes and is still used for groynes and harbour works.It was formerly a favorite timber of coffin-makers. Grown from seed which is not dormant. Approx 40,000 seed per kg. Does not sucker. Takes approx 30 years before seeds are produced and then every 2 or 3 years. In the wild seed germinate shortly after falling.